The Food Pyramid is out, the Plate is in! It does make me pretty happy to see our goverment finally awaken to the fact that Americans, most of the time, succumb to eating a poor diet consisting of fast food, too much of one thing and not enough of the other. However, you didn’t have to tell me that eating right (mostly plant-based of course) and physical exercise are two very key things to healthy living (don’t forget to keep your mind and soul healthy too). Check out CNN’s article dicussing the topic. Thanks for your intelligent comment on my blog about the new food guide. I completely agree that it’s a step toward directing Americans to a healthier diet and hopefully, will lead to more people adopting healthier choices when they making food decisions. This, of course, remains to be seen. I’m not lactose intolerant, but after not drinking milk for a number of years, I’m certainly more sensitive to it when I happen to have some by mistake, so I understand your disappointment with the circle off to the side labeled “dairy.” Certainly, as vegetarians or vegans, we need to know more about nutrition, including the need to mix legumes with whole grains or nuts to ensure that they provide us with whole proteins. But I think that once you know that, it becomes automatic. Like you, I’d rather take more time to think about what I’m eating, rather than just reach for a steak or other source of meat to make sure I’m getting protein and iron. 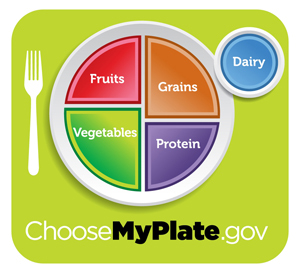 Again, MyPlate is definitely a step in the right direction, but that doesn’t mean that there isn’t room for improvement the next time around. It was good to read your comment about MyPlate. I agree that it’s really important for the US government to acknowledge that many Americans have a very unhealthy lifestyle.